Remember when FM radio hit the market? If not, you're lucky enough to be young! It was a big thing though, FM signal processing was invented, and boy did it sound good. You often hear about FM and you'll find it's terminology obscurely hiding away in some corners of your favorite synths and effects, but what does it actually do? And is this the same thing as that AM/FM radio thing? This workshop is for anybody that wants to get a full grasp on what Frequency Modulation is all about, which will allow you to use it in a variety of ways throughout your productions, not just in FM Synthesizers. After all FM is just a modulation technique - on steroids. Understanding it's, often subtle and delicate, approach is a key to getting a whole range of new sounds, from simple but complex timbre variations to wildly aggressive lead and bass sounds. Rather than just talking about one synth in this workshop, we are going to talk about the entirety of FM and what it can do with our signals (sounds!). Seeing Frequency Modulation at work in a variety of ways like this will help you to get a better understanding of it's strengths and weaknesses, as well as giving you a good idea on when to use the technique. After that we will dig even deeper as we venture into every detail of FM8, showing different workflows, and exploring lots of practical examples and useful tips along the way. You will learn how envelopes are the filters of FM synthesis and how frequency ratios affect timbres in previously surprising ways. 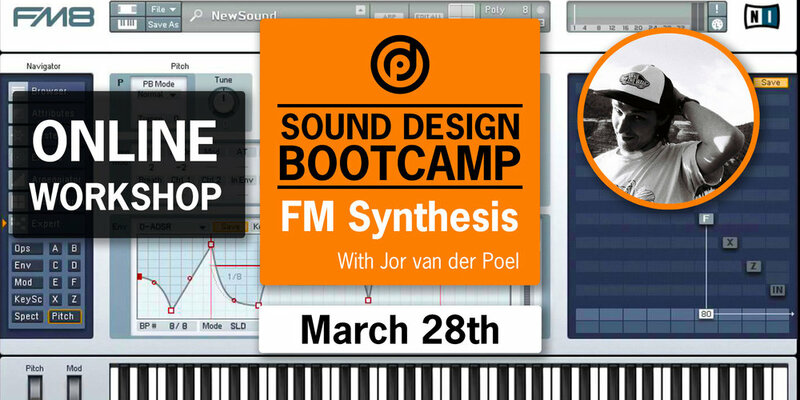 This workshop is one of the most extensive overviews of FM synthesis out there and will take you from the very start to being a crazy mad FM scientist. No joke. My name is Jor van der Poel, I was born in Groningen, The Netherlands but I am currently living in Vancouver BC. I am a music producer, arranger, teacher and sound designer. I am certified in both music theory and sound design education. Besides acoustic music, I also love the extreme flexibility of synthetic sounds which made me want to learn about sound design, mixing and mastering. I spend a few years practicing this 8 hours a day, I got pretty good at it and 3 years ago I started making weekly sound design videos for the online community ADSR. This introduced me to a lot of people in the music industry, and taught me more about educating others. It also got me on the sound design team of Camel Audio, where I made factory library patches for their Alchemy synthesizer. I enjoy letting students explore music in a way that feels natural to them. Sharing all the theoretical and technical knowledge that I’ve gained over the years with my students is just the beginning. I help people with their mixes and arrangements and we talk about workflows and together we work to develop a good mindset for creating music. I truly love providing private 1-to-1 mentorship lessons.